Should get you $50 off $150, works for existing accounts one time. It's October 1st, so it's a new month and the first day of Q4. Time for some new deals! Last month we were talking about maximizing the AmEx Offer for Wine.com. Since then I've been on the look-out for good promo codes to stack with the deal. I got an email from Wine.com touting a $20 back on $50 offer which turned out to be a typo. It's $150 back on $150 with code FALLSAVE20. 13.3% isn't too shabby, and the code can be used multiple times. $50 off $150! Wowza. If we're getting 20% off with the AmEx Offer, plus 33% off, plus whatever cashback we can get through a portal - that's some serious savings. The $50 off $150 WINE50 code appears to be limited to one use per account, which is problematic for repeat orders on the account you have StewardShip on. But the savings are so significant it might make sense to create a new account(s) and just stomach the high shipping costs. I show that it's $13.65 to ship the first bottle so if you're buying expensive wines that's still around a 25% discount with the $50 off $150. And if you're completely new to Wine.com and want to get going with an account with StewardShip you could use code $30 off $100: OCTNEW30. Lots of permutations and combinations here that might make sense depending on the number of AmEx Offers you have at your disposal. On the portal front, I've been tinkering with a newish shopping portal called Lemoney. Whereas the best rate for Wine.com across the merchants listed on Cashback Monitor is around 5%, Lemoney is offering "16% Turbo Cashback" for Wine.com. 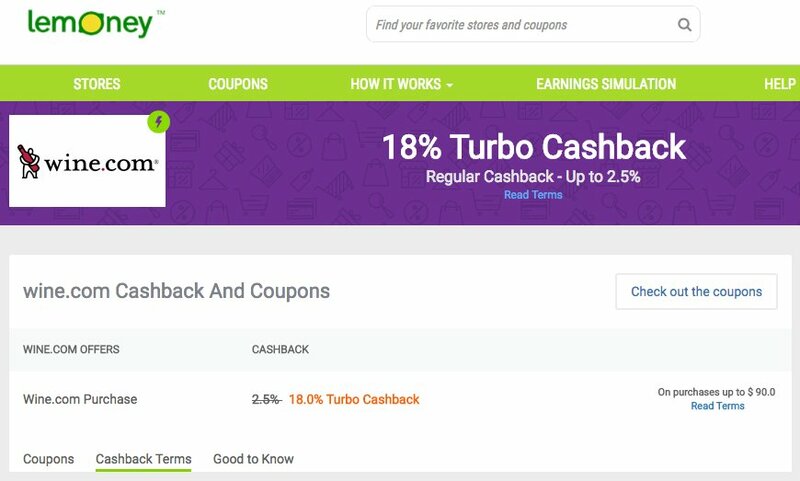 The way Lemoney's Turbo Cashback [supposedly] works is you get 16% on purchases, once a month, up to a certain dollar amount. And you need $25 in cashback in order to cash out. I've done a couple of trial purchases with other merchants and they've tracked but not yet posted. We'll see how it goes. If you'd like to sign up for Lemoney you can use my referral code below. I think they use some kind of pyramid scheme whereby people in your referral "community"earn you additional cashback. Who doesn't like a little good old fashioned multi-level marketing? Here's 10 of my favorite wines they've got available.